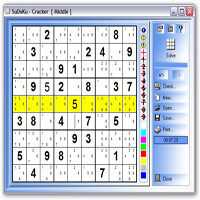 At first glance, SuDoKu Cracker is your average online SuDoKu game. You will just have to complete the numbers 1 to 9 in each 3X3 box, row and column. As you do so, you must take the principal rule of the game in mind: you cannot afford to have two of the same number in the same column, row, or 3X3 box. Simple as the rules may be, it can get more challenging as the visible numbers get fewer and fewer. Like other Sudoku games, SuDoKu Cracker is all about following this rule and solving one puzzle after another. The astounding difference that has made it stand out among other similar online puzzles is the threefold functionality of the game: you can play the game, create a puzzle of your own for others to solve, or get help from the software if you find a puzzle particularly difficult. There are seven difficulty levels in this game, from Very Easy to Super Sudoku. While the basic levels are easy enough to cover, you may need the help of program in the latter stages. The help it can give you ranges from simply getting a hint to having the puzzle solved in a click. SuDoKu Cracker is also convenient and sensitive to busy people like me, who doesn’t have the time to play Sudoku all day long – even if I wanted to. That’s why you can save an unfinished game either in .txt or .sdk format. You can even print it and answer it when you are away from your computer! There are plenty of other features in this game that you won’t find in others. You can undo your moves in a jiffy, mark cells, rows or columns in different highlights, or strike out numbers. Playing SuDoKu has never been easy and convenient! SuDoKu Cracker is published by KSAW – Konsulentselskapet Sivilingenir Arne Webby. The company has more than 20 year of experience with computer, and programming in C++, Asembler, Pascal, and Clarion and it’s headquarters are located in Fredrikstad, Norway. I’m a keen Sudoku-Cracker 10.09 player. I have a problem in that my OLD PC is nearly dead and while I was able to download this software on my NEW computer, I just can’t get the Registration serial number which is a requirement with the pop-up screen for the full download. There is no explanation as to how you acquire this serial!! Are you able to offer some guidance here?